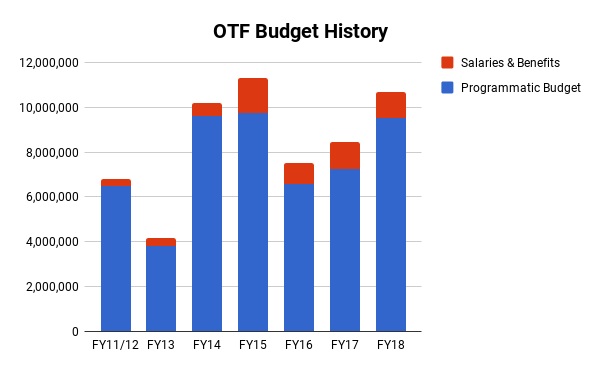 In April, following the passage of the Consolidated Appropriations Act, 2018 (“the Omnibus”) by Congress, we discussed in a blog post OTF’s Fiscal Year 2018 (FY18) funding outlook. At the time, we noted that the exact portion of Broadcasting Board of Governors (BBG) internet freedom funding allocated to OTF for FY18 was not yet finalized, but that we would follow up once that figure was determined. Following approval of our budget by the US Agency for Global Media (USAGM, formerly BBG) CEO and Congress, OTF received a total of $10.7 million. This represents an increase of $2.3 million over FY17. 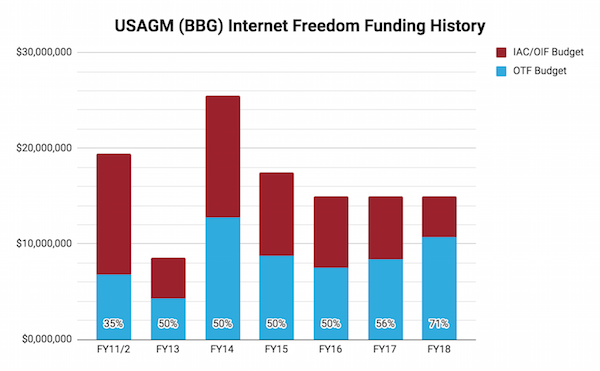 OTF’s total budget figure for FY2018 represents the largest share of the total USAGM budget for internet freedom that OTF has ever received. The remaining $4.3 million is allocated to the USAGM’s Office of Internet Freedom (OIF), which focuses on the digital security and content delivery needs of USAGM journalists and audiences, in addition to its role in the oversight of all USAGM internet freedom funds. With respect to the following chart, note that the OIF replaces what was formerly the BBG’s Internet Anti-Censorship (IAC) Division. Given the continuing downward trend in internet freedom globally, we welcome this increase in funding over previous years as it will allow for the further support of vital, innovative projects working to combat repressive censorship and surveillance in the world’s most restrictive environments. Within this context of worsening online freedom worldwide, it is perhaps unsurprising that OTF has seen demand for support requests rise to unprecedented levels this year: As mentioned in our August 2018 monthly report, during the September 1 round, OTF received more than 200 concept notes for the first time ever in a single round, bringing the total number of funding requests received for the 2018 calendar year to over a thousand - also a program first. With the November 1 round open and accepting applications, that number is sure to increase - demonstrating that in the realm of internet freedom, demand for solutions still far outstrips the available supply of funds. If you are working to advance internet freedom and are in need of support, feel free to explore OTF’s available funding mechanisms as described through our funds, fellowships, and labs, and apply if you think your idea is a good fit. We look forward to hearing from you and reviewing your application.